Every year, Starbucks debuts brand new coffee drinks into cups with millions of hilariously misspelled names on them. You might’ve heard of a few! The Witch’s Brew Frappuccino launched as a limited-time offering for Halloween, the Ultra Caramel and Triple Mocha Frappuccinos became permanent fixtures in May, and Cold Foam Cascara Nitro Cold Brew was introduced in April. And it’s this last drink -- the cold brew with its game-changing layer of cold foam -- that is the best drink Starbucks released in 2018. Whether you’ve had it a million times or don’t even know what the heck cold foam is, it’s this unique feature that makes the Cold Foam Cascara Nitro Cold Brew the finest new Starbucks offering of 2018. What the heck is in this drink, anyways? Ok, let’s break down this cold coffee triumph piece by piece. Starbucks didn’t invent cold foam in 2018. The company hatched the idea way back in 2014 inside its Seattle-based coffee amusement park slash tourist destination Reserve Roastery and Tasting Room. That’s where Starbucks often tests its newest creations out in the real world. If you’ve never been, it’s worth the visit. I drank my first (and only) bourbon barrel-aged cold brew coffee there, and it’s still one of the finest coffee beverages I’ve ever experienced. The 2018 version sweetens the foam by adding cascara syrup (made from coffee cherry syrup), cane sugar, and organic coconut sugar. And it’s not a sugar bomb like a Frappuccino -- a Grande has 18g of sugar, compared to the 50g+ in many Frapps. You can now get cold brew at every single Starbucks location, but finding nitro cold brew is a little more difficult. Not every location is equipped with a tap to pour it from, but when you do find one, don’t pass it up. Nitro cold brew is cold brew that’s been infused with nitrogen. Imagine what a Guinness tastes like, but without all the booze. It’s chocolatey, creamy, caffeine-packed, and all with zero grams of sugar. 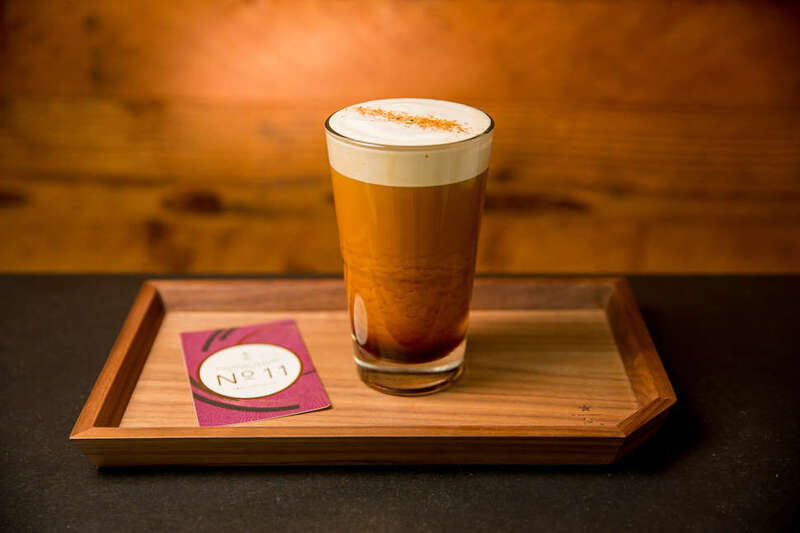 When you top that glorious nitro cold brew with cascara cold foam, something happens. You make an already decadent drink that much more tasty, and all without the sugar you’ve come to expect when ordering something decadent at Starbucks. The drink also looks different than your typical ‘Bucks drink. It comes with a curvy, straw-less lid that allows you to better sip and appreciate both the layer of foam and the coffee beneath it. Sure, you have a 100% chance of getting a foam mustache, but that’s a huge plus in our book. And don’t you dare shove a green straw in this thing. Would you ever stick a straw in a stout? Of course not, you’re not an animal! As iced coffee becomes a drink Americans are now consuming year-round (Exhibit A: the increasingly crowded shelves of cold brew at the supermarket), Starbucks has accepted the fact that cold foam cold brew isn’t just something you can enjoy in the summer months -- you can presently order it while other people in line are asking for Peppermint Mochas and Gingerbread Lattes. The days of pouring hot coffee over ice are done. Adding cold foam to nitro cold brew was a seriously inventive addition to the iced coffee game in 2018, and it’s one we think is here to stay.